A reliable source for Packaging Tables information and a resource for accessing leading Packaging Tables and suppliers. Packaging tables are designed to provide the best possible table in order to promote efficient packaging and to add value to your overall process by speeding up the packaging step. These tables come in hundreds of different designs, all with different features, measurements and options based on your specific application and need. Packaging Tables Packaging tables are designed to provide the best possible table in order to promote efficient packaging and to add value to your overall process by speeding up the packaging step. These tables come in hundreds of different designs, all with different features, measurements and options based on your specific application and need. Regardless of what you decide is best for your application, the ultimate goal of any packaging table is to provide advantages to worker productivity and efficiency. 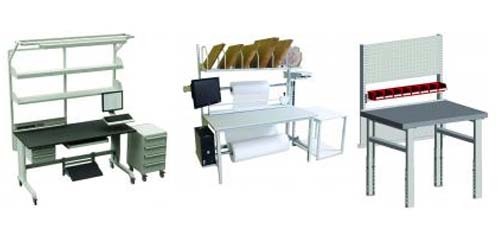 The proper packaging table will increase the organization and product flow of your process while also creating the maximum storage space possible for your packaging needs. 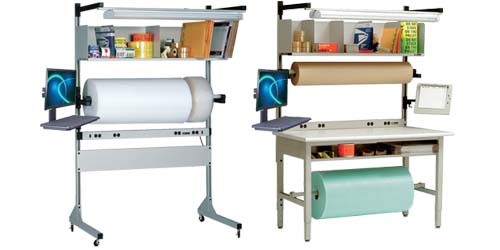 In addition to promoting organization and providing additional storage space, these packaging tables also increase your overall floor space as they are designed to utilize a small space within a work station while maintaining the work load of your previous layout. Also, due to the increased organization, the packaging process becomes more efficient which may increase your workers overall morale and productivity. One of the most underrated benefits of a proper packaging table is the increase in overall aesthetic appeal of your workspace by reducing packaging clutter and taking up less space than your former layout. We encourage those who are looking for a proper packaging table to seek out an experienced packaging table manufacturer who is able to listen to your application. Whatever your applications may be, they can assist you in acquiring the best possible packaging table based on your unique needs and specifications. By doing so, you ensure that you are benefiting your process by purchasing the best possible packaging table for your needs.